[T]he key difference between 911 and Katrina: both Manhattan and D.C. recovered from the terrorist attacks on 911. But the nation did not. With Katrina, on the other hand, the nation got over it, but the victims, the dead, their loved ones, their comunities, especially the poor African Americans of the lower ninth, as well as the working people all along the gulf...they did not. The word "will" comes up constantly in the Lower Ninth Ward now; We Will Rebuild is spray-painted onto empty houses; "it will happen," one organizer told me. Will itself may achieve the ambitious objective of bringing this destroyed neighborhood back to life, and for many New Orleanians a ferocious determination seems the only alternative to being overwhelmed and becalmed. But the fate of the neighborhood is still up in the air, from the question of whether enough people can and will make it back to the nagging questions of how viable a city and an ecology they will be part of. The majority of houses in this isolated neighborhood are still empty, though about a tenth of the residents are back, some already living in rehabilitated houses, some camped in stark white FEMA trailers outside, some living elsewhere while getting their houses ready. If you measured the Lower Ninth Ward by will, solidarity and dedication, from both residents and far-flung volunteers and nonprofits, it would be among the best neighborhoods in the United States. If you measured it by infrastructure and probabilities, it looks pretty grim. There are more devastated neighborhoods in New Orleans and neighboring St. Bernard Parish, let alone Mississippi and the Delta, but the Lower Ninth got hit hard by Katrina. Its uncertain fate has come to be an indicator for the future of New Orleans and the fate of its African-American majority. 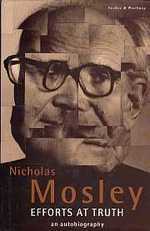 Nicholas Mosley is thought of as an important but almost incomprehensible novelist. For 60 years, he has tapped away like some mad cryptographer, transmitting messages in an unknown code. Occasional successes—Accident was made into a film, Hopeful Monsters won the 1990 Whitbread prize—have heartened but not distracted him. I recently met Mosley—whose books are being published in new editions by Dalkey Archive Press—in his basement flat in north London. Aged 84, he seldom goes out. His voice sounds tired; sometimes it trails off into silence. Yet the occasional flash of the eye and whooping laugh betray inextinguishable high spirits. He styled himself as the "King of Cats," which is also the title of his only self-portrait. It shows a spoilt, imperious creature of the oldest, irresistible aristocracy, a "King of those regions that will remain forever unknown to my gloomy contemporaries," as the young painter once said of himself. The cat has, of course, always been the heraldic animal of this prince, ever since Rilke added a preface to the little picture book Balthus made as a boy. It is the tale of the mysterious, seductive cat "Mitsou", which appears out of nowhere and disappears into nowhere. It is a creature one remembers as one might an apparition that appeared in a voluptuous Sunday afternoon dream. Hence the poet's reassuring words at the end of his short preface: not the cat, but Balthus exists. more from Sign and Sight here. The typescripts—two speeches Strauss delivered in the 1940s—left plenty of questions unanswered. They didn’t lay out in perfect clarity Strauss’s opinions on practical politics; they hinted at them. But Tarcov hoped they would correct what he saw as one of academia’s most sensational urban myths: the notion that Leo Strauss—though he’d died in 1973—was responsible for the rise of America’s neoconservatives and even for the 2003 invasion of Iraq. more from The Chicago Reader here. Microorganisms such as bacteria enjoy swapping genes, and the trades have made a big difference in how they've evolved. Now new research suggests that bacteria are also easygoing about passing genes on to more complex organisms. The findings have researchers rethinking the prevalence of interspecies gene transfer and its role in evolution; they may also change the way geneticists filter out bacterial "contamination" when they sequence a new genome. So-called lateral gene transfer is ubiquitous among bacteria--they can acquire antibiotic resistance by swapping genes with species that have evolved it--but transfers between bacteria and multicellular organisms were thought to be rare. Some of the few known cases involve genes from parasitic bacteria called Wolbachia, which infect 20% to 75% of insects, as well as other invertebrates. The parasitic bacteria live within their hosts' cells, including the germ cells that give rise to eggs, and in past studies scientists found its genes in the genomes of two worm and insect hosts. However, according to microbiologist Julie Dunning Hotopp of the J. Craig Venter Institute in Rockville, Maryland, common wisdom holds that these transfers are uncommon, and so genetic sequences from bacteria like Wolbachia are considered to be contamination when they're found in insect genomes. Suspecting that their treatment as contaminants was masking transfers' true frequency, Dunning Hotopp and her colleagues screened animal genetic databases for Wolbachia sequences. Reporting online 30 August in Science, the team found them in three wasp and four worm species. In the wasps, the DNA was a 96% match to each wasp's resident Wolbachia strain. It is nearly impossible to get screws in Budapest. I'm speaking of the metal fasteners. 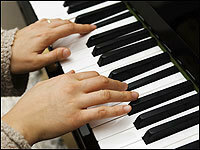 They don't seem to have them at any of the hardware stores or, if they do, they are so expensive as to be unattainable. Screws are a dream here, an unfulfilled fantasy. I have never wanted to buy screws so badly before. No one has. Finally we found the screw man. You have to come into his office and you have to have a sit-down about screws. You have to talk to him about the kinds of screws you want and why you want them. Suddenly, this seemed right to me. And always the streets are strangely empty. On the weekends, especially, you can hear the lone steps of infrequent passersby ricocheting up through the buildings of stone and brick and in through your open window. Late at night a couple stumbles out of a cellar bar somewhere and scampers giggling down the street. They are whispering to one another, but the whispers are carried in the night air and amplified so that their private nothings become public performance. "You little devil you, you little devil. I'll eat you up alive." On Sundays everyone goes to a long family brunch that they hate. More here. And for more on Morgan's recent art project in Budapest, go here. 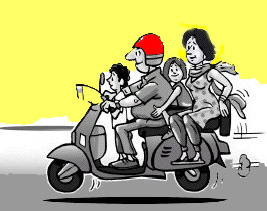 India's 200m-strong middle class is the most economically dynamic group on the planet, but is largely uninterested in politics or social reform. Until it begins to engage politically, India will suffer from a lop-sided modernisation. As the actual Mother India celebrates the 60th anniversary of her independence, there is....both surging optimism and crushing despair about her future. As the saying goes, everything and its opposite is true in India. The seven Indian Institutes of Technology rank near the top of global surveys, and job offers to graduates from the Indian Institutes of Management rival those to graduates of the famous US business schools; yet a third of the country is still illiterate. Three hundred million Indians live on less than $1 a day—a quarter of the world's utterly poor—yet since 1985, more than 400m (out of a total population of 1bn) have risen out of relative poverty—to $5 a day—and another 300m will follow over the next two decades if the economy continues to grow at over 7 per cent a year. Population growth, even at a slower pace, will mean that there will still be millions below the poverty line, but the fall in number will be steady. At the other end of the scale, India has the largest number of dollar billionaires outside the US and Russia. Fishermen, traders, and consumers have all benefited from the fishing industry’s adoption of mobile phones in Kerala, India, according to research published by Watson Visiting Professor Robert Jensen in this month’s Quarterly Journal of Economics. In one of the first rigorous, empirical studies of the benefits of information and communication technologies (ICTs) in poor countries, Jensen goes beyond the largely anecdotal body of evidence currently dominating the discussion of the so-called “digital divide” between the rich and poor. The best talk I heard at the International Congress of Logic Methodology and Philosophy of Science in Beijing was, somewhat to my surprise, the Presidential Address by Adolf Grünbaum. I wasn’t expecting much, as the genre of Presidential Addresses by Octogenarian Philosophers is not one noted for its moments of soaring rhetoric. I recognized Grünbaum’s name as a philosopher of science, but didn’t really know anything about his work. Had I known that he has recently been specializing in critiques of theism from a scientific viewpoint (with titles like “The Poverty of Theistic Cosmology“), I might have been more optimistic. Grünbaum addressed a famous and simple question: “Why is there something rather than nothing?” He called it the Primordial Existential Question, or PEQ for short. (Philosophers are up there with NASA officials when it comes to a weakness for acronyms.) Stated in that form, the question can be traced at least back to Leibniz in his 1697 essay “On the Ultimate Origin of Things,” although it’s been recently championed by Oxford philosopher Richard Swinburne. The correct answer to this question is stated right off the bat in the Stanford Encyclopedia of Philosophy: “Well, why not?” But we have to dress it up to make it a bit more philosophical. Although we are what we eat, we are by no means only what we eat. Some people, for instance, can consume all the fatty foods they want—meat, cheese, butter, ice cream—but somehow manage to stay rail-thin and enjoy low blood triglyceride levels, whereas others living on the same rich fare would soon develop potbellies and clogged arteries. The significant genetic and metabolic variation among individuals makes it almost impossible for experts to prescribe detailed nutritional recommendations that work optimally for everybody. As nutritionist Marion Nestle recommends in her article “Eating Made Simple,” beginning on page 60, the best we can do today is to adhere to the time-honored advice to eat less; exercise more; eat mostly fruits, vegetables and grains; and avoid junk foods. But this basic regimen leaves many concerned Americans with unresolved issues about dietary choices, especially those regarding specific foods promoted by food companies and their lobbyists: Is milk bad for adults? Should I eat more fish? Are organic foods better? More specific guidance regarding food selection would help. Gene expression changes brought on by heavy smoking may persist long after the smoker has kicked the habit, researchers have found. The results could provide a molecular explanation for the continued increased risk of lung cancer and other pulmonary ailments among former smokers. When smokers quit, their bodies gradually begin to undo the damage cigarettes have wrought. But contrary to popular belief, not all of the body's systems make a full recovery. Although the risk of heart disease, for example, eventually returns to that of a nonsmoker, the risk of getting lung cancer and emphysema — a progressive lung condition that leaves sufferers struggling for breath — remains elevated even if the patient hasn't smoked a cigarette in decades. "You are reducing the risk of disease by quitting," says Raj Chari, a cancer biologist at the British Columbia Cancer Research Centre in Vancouver, Canada, "but it isn't going back to zero." The nun's leading critic argues that her crisis of faith—revealed in newly published letters—was brought on by the crushing unreasonableness of the Roman Catholic Church. The publication of Mother Teresa’s letters, concerning her personal crisis of faith, can be seen either as an act of considerable honesty or of extraordinary cynicism (or perhaps both of the above). These scrawled, desperate documents came to light as part of the investigation into her suitability for sainthood; an investigation conducted by Father Brian Kolodiejchuk, the Canadian priest who is the editor of this volume. And they were actually first published in the fall of 2002, by the Zenit news agency—a Vatican-based outlet associated with a militant Catholic right-wing group known as the Legion of Christ. So, which is the more striking: that the faithful should bravely confront the fact that one of their heroines all but lost her own faith, or that the Church should have gone on deploying, as an icon of favorable publicity, a confused old lady who it knew had for all practical purposes ceased to believe? I am arguing, along with theorists who view creativity in terms of evolution, that there is no significant creativity without a foundation in tradition, which symbolizes all that is memorable, mature, and of demonstrable value in a society, implying that tradition can never lose meaning and will always reward reflection; and iconoclasm that questions the finality and values of tradition and challenges traditional modes of understanding, but that remains valueless unless it achieves its own finality by becoming part of and holding its own in tradition, thus gaining lasting meaning and proving its continuing value to society. I happen to think that avant-garde art has not unequivocally done so, however representative it is of modern society, with its cult of youth, indeed, its fetishization of youth, and can never convincingly do so, because to be avant-garde means to be incorrigibly adolescent in attitude and thus unable to relate to and respect tradition, which does not mean to blindly conform to it. Adolescence can express itself but not reflect on itself, which is why avant-garde art cannot become seriously traditional, that is, a civilizing force. One of the negative consequences of the so-called “period of transition” in Macedonia which started, as in most Eastern European countries, at the beginning of the 1990s, and which is still going on in the Balkans, was the closing of a large number of bookstores. The privatization of the publishing industry during the transition period as well as the desire of the new owners to get rid of large unprofitable spaces—a result of the significant drop in book demand which in turn was the result of the dramatically decreased purchasing power of the population— were the reasons why a large number of bookstores had to close down. Today, a decade and a half later, things are moving in a different direction: new bookshops are being opened and most of them function as cafés/bookshops. A few of them, like the bookshop at the “Tochka” (Dot) Cultural Center, are only one part of a much wider concept of exhibition spaces which host debates and symposiums dedicated to the work of artists from Macedonia and around the world. Dubravka Ugresic and Guyatri Chakravorty Spivak, the world-famous writer and theoretician, have been among the participants at these symposiums. These are sure signs that the previously frozen Macedonian cultural life is experiencing a thaw of revival. We used to believe”, laments J. M. Coetzee’s fictional writer Elizabeth Costello, “that when the text said, ‘On the table stood a glass of water’, there was indeed a table, and a glass of water on it, and we had only to look in the word-mirror of the text to see them. But all that has ended.” Quite. Coetzee has always avoided the flat mirror of realism in favour of the many-layered mise en abyme of metafiction, and his Elizabeth Costello (2003) is a case in point: not so much a novel as a series of infinitely regressed reflections on the nature of writing itself and the writer’s contract with the reader. 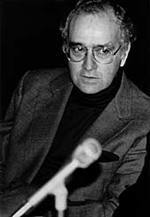 Costello first appeared in 1997, in a journal article by Coetzee called “What Is Realism?”, later took centre stage in The Lives of Animals (1999) – quite literally, being Coetzee’s preferred voice for the Princeton Tanner Lectures on which that book was based – and has since featured as a deus ex machina author figure in his novel, Slow Man (2005), popping up to debate the interrelationship between the real and the literary with the book’s main character, Paul Rayment. The TLS printed a cartoon of Coetzee in drag (September 5, 2003), and even the most astute of his critics fell into the trap of accepting the outspoken Costello as a surrogate for the notoriously guarded Coetzee himself. 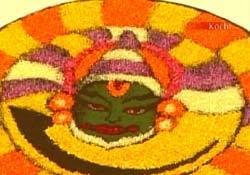 Onam is the biggest festival of Kerala, celebrating the visit of King Mahabali to Kerala. His visit is a boon from Lord Vishnu. The festival is celebrated as a tribute to the sacrifice of King Mahabali. Every year people make elaborate preparations to welcome their King whom they affectionately call Onathappan. They wish to please the spirit of their King by depicting that his people are happy and wish him well. It was said Mahabali was very generous and charitable. Whenever anybody approached him for help or requested for anything he always granted. To test the King, Lord Vishnu disguised himself as a dwarf and a poor Brahmin called Vamana. He came to the Kingdom of Mahabali, just after the King performed his morning prayers and was preparing to grant boons to Brahmins. As Vamana, Lord Vishnu said he was a poor Brahmin and asked for a piece of land. The generous King said he could have as much land as he wanted. The Brahmin said that he just wanted as much land as could be covered by his three steps. The King was surprised to hear but agreed. A learned adviser of the King, Shukracharya sensed that Vamana was not an ordinary person and warned the King against making the promise. But, the generous King replied that it would be a sin for a King to go back on his words and asked the Brahmin to take the land. The King could not imagine that the dwarf Brahmin was Lord Vishnu himself. Just as King Mahabali agreed to grant the land, Vamana began to expand and eventually increased himself to the size of cosmic proportions. With his first step the Brahmin boy covered the whole of earth and with the other step he covered the whole of the skies. He then asked King Mahabali where is the space for him to keep his third foot. The King realised that he was no ordinary Brahmin and his third step will destroy the earth. Mahabali with folded hands bowed before Vamana and asked him to place his last step on his head so that he could keep the promise. Cutthroat competition in the testes might explain the unexpected prevalence of a mutation that halts skull growth and fuses fingers and toes. The genetic glitch seems to give some sperm precursors an advantage by speeding their division, a new study suggests. Apert syndrome afflicts one in every 70,000 children who are born with fused bones in their heads, hands, and feet. That incidence, although low, is 100 to 1000 times higher than the average mutation rate. The fault occurs at one spot on a single gene on chromosome 10 and is linked to the father's age. Researchers first theorized that the site might be susceptible to genetic errors, a mutation "hotspot." More recent studies posited that the mutation might instead confer some advantage to germline cells--sperm progenitors--in natural selection. Computational biologist Peter Calabrese of the University of Southern California (USC) in Los Angeles developed mathematical simulations of how the mutations might arise and develop in each scenario. Neil Chambers' edition of The Scientific Correspondence of Sir Joseph Banks leaves Andrea Wulf awed by the naturalists networking prowess. In 1761, the 18-year-old Joseph Banks inherited several estates in Lincolnshire, providing him with a substantial income for the rest of his life. After he finished his studies at Oxford, he moved to London where he became a member of the Royal Society and the Society of Antiquaries. He spent much of his time in the damp reading room of the new British Museum, where he studied the herbaria of Britain's greatest plant collectors, utterly obsessed with botany and the workings of the natural world. It was this preoccupation that distinguished Banks from other men of his class, prompting him to exchange his comfortable life for the hardship and danger of the most daring voyage that the British had ever undertaken. Unlike his peers who toured the ancient treasures of Europe, Banks reputedly said "every blockhead does that. My Grand Tour shall be one around the world". And so, in August 1768, Banks boarded Captain Cook's Endeavour. For the following three years, he lived in a windowless cabin that was no bigger than a modern king-size bed, with a diet of pickled cabbage, insect-infested biscuits and the occasional dog stew. During that time, he collected 3,600 species of plants in Tahiti, Australia and South America - 1,400 of which were new to English botanists. When Banks returned to Britain, he had become the most famous man in the country - rich, dashingly handsome with an alluring aura of adventure. Within a few years he was the nominal director of the royal botanic garden at Kew and the president of the Royal Society (a position he held for more than 40 years - longer than anybody before or since). During his life he shaped colonial politics, was an intimate of King George III and served as an adviser to the government. Pakistan's President, Gen. Pervez Musharraf, has agreed to step down as the country's military chief during negotiations on a power-sharing deal with Pakistan's former prime minister and opposition leader Benazir Bhutto, she told CNN Wednesday. "This is no longer an issue in the negotiations, because General Musharraf recognizes that it is very difficult to move to a transition towards democracy when there's a chief of army staff ruling the country," Bhutto told CNN. "I think he wants to make the right decision, so I expect he's going to take the uniform off." Pakistani cabinet minister Sheikh Rashid confirmed that Musharraf has agreed to step down as army chief. But it is up to Musharraf to announce his decision, Bhutto said, adding that the issue of his role as army chief is "no longer a hurdle in the negotiations that the opposition and I have been having with him." "Earlier we had left it to the courts to decide this issue," she said, referring to Musharraf's army chief position. "But now we have bilaterally decided that this issue will be resolved." Bhutto has previously said she is considering returning as Pakistan's prime minister under Musharraf's government if he steps down as head of Pakistan's military. She said negotiations between her opposition party and Musharraf involve appointing a caretaker government, holding fair elections and returning to parliament powers that were removed after the 1999 coup in which Musharraf seized power. A power-sharing deal between Bhutto and Musharraf would require Pakistan's Supreme Court to change the country's constitution to allow Musharraf to seek a third term. These folks have a case. Major Jewish organizations, including centrist as well as hard-line groups, regularly use their clout to narrow the scope of acceptable public debate on Israel. They cast their net wide, indiscriminately targeting independent-minded allies of Israel along with its sworn enemies. Many pro-Israel dissenters have walked away feeling deeply bruised and disillusioned. Lately, however, some of Israel’s critics have started learning a few tricks themselves — and rather than enriching the conversation, they are choosing to further muddy it. There are substantial numbers of true moderates in this country who believe deeply in the need for Israeli-Palestinian reconciliation. They struggle to make their voices heard in a hostile political and communal environment, and they naturally look for spokesmen who can capture the public’s attention and help unite and mobilize the peace camp — including, most recently, scholars Stephen Walt and John Mearsheimer. We are sympathetic to this quest for leadership, but after firsthand experience of these scholars’ definition of “opening the debate,” we feel compelled to speak up: They’re the wrong guys. There will be more, to be sure.